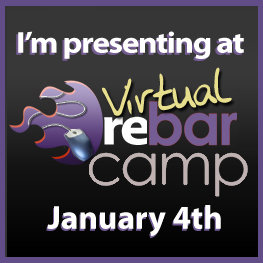 Virtual RE Bar Camp- Register for Free! Educating Real Estate Agents On How To Use Modern Technologies To Better Their Business Will Never Be The Same! On January 4th, 2010 dozens of the most respected educators in the real estate industry converge to host most exciting event of its kind, the Virtual Real Estate BarCamp. Virtual Real Estate BarCamp is a 1-Day Learning Extravaganza. From 9am until 4pm PST, three concurrent webinar "rooms" will each host 7 different sessions, for a total of 28 different presentations. There is something for everyone and everything for someone, and best of all, IT IS FREE and attendance is unlimited! Check out the Session Calendar. Attendance is projected to be at least 1000 agents, nationwide. Do not miss out on being part of this ground-breaking event. ...and much more, with new sessions being added every day. And if that wasn\'t cool enough, individuals from around the country are volunteering to host In-Real-Life MeetUps for after the event. Learn all day, and then meet to have a beer with local participants. This is going to be a blast!